Collaboration with Bryan Dosher. Constructed in San Diego CA, 2013. I stayed to play in Ithaca New York after I competed in the 2013 Pipe Classic in Burlington Vermont. "Autumn Sunshine" is a collaboration I did with Karl from Termini Tubes. I asked Golden Gate Glassworks out of Eugene Oregon to make me some custom very gold dichro tubing. "Buttercups" was the first piece I made with my new pretty material. 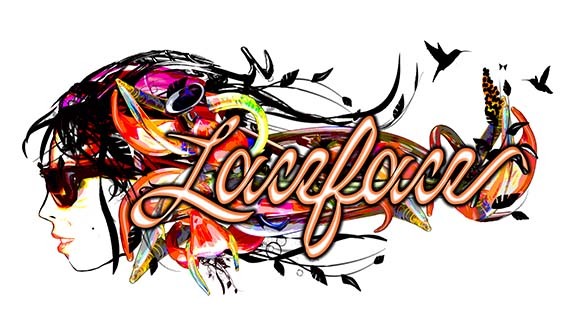 Created in Seattle Washington 2013. Photo by Jeremy R. Derks. "Dino Sacrafice, You Are My Religion"
Some pieces decide when they want to build themselves. This was the case with "Dino Sacrifice, You are my religion". Elbo came to spend much of the winter of 2013-2014 up in the mountains of Evergreen. Very proud of his new tattoo, he told me the story of the Dino. He told me about how a long time ago in the very distant past the Dino's ruled his world. One Dino in particular opened his eye's and tought him the secrets of this prehistoric world. These lessons were so profound to Elbo's understanding of the world that he was forever changed, and he fell in love with that Dino. But this is not a happy story, because the the Dino didn't love him back. He begged and begged for the Dino to love him. But the Dino had no ears to hear him. Done with the teachings, the Dino disappeared leaving Elbo heartbroken, lost and all alone in the prehistoric world. But Elbo couldn't let her go. He preyed everyday for her return, visions of Dino decorated his daily devotions for years until he could no longer stand to wait. He had to resort to drastic measures.... Christmas Eve of 2013 found Elbo and I bowing to the heavens while presenting this offering to his long lost Dino Love. In a desperate plea, Elbo offered himself as sacrifice hoping it would be enough to bring her back. Christmas eve turned into Christams day... Christmas day lead into the new year, where Elbo still waits for the resurrection of his precious Dino Love. Constructed in Evergreen CO. Christmas 2013. I was driving through Grants Pass Oregon in 2013 and decided to make a pit stop at Darby Holm's studio. There I meet BMFT (Brendan Taylor) for the first time. He was making these objects called Milk Bottles at the time, so we decided to have a little throw down. Nobody likes to wait "In Limbo" but perhaps going through limbo is the only way to get anywhere. "Laid back" Is the third collaboration I did with Darby Holm. This piece was created in Grants Pass Oregon in 2013. "Little Blue Bird" was created in Seattle Washington in 2013. July 2013 Created in San Diego CA. In our journey to reach higher ground, we often encounter trials on the path. We are judged, mocked, and misunderstood... we are tested. This world will try its hardest to steal our joy and love, but it's your territory alone, and you must defend it. These trials, for better or worse shape who we are, and when we finally reach the top of that mountain, we have evolved into a wiser, more fully realized version of ourselves. We must always carry with us the spirit of Red Feather. For she may get broken, but she will not lay down. She will not disappear, she will not back down. She will lick her wounds and rise again, much stronger than before, running straight up that mountain, and you will hear her howl at the moon. "Moon Goddess" Created in Seattle Washington 2013. Stand made by Sam Sharf. Photo by Jeremy R. Derks. "New Blue Moon Goddess" was created in San Diego CA 2013. "Pink Orchid Pods" was created in Seattle Washington in 2013. Photo by Jeremy R. Derks. "Scarlett Blossoms" was an experiment with the new custom emerald dichro tubing I received from Golden Gate Glassworks in 2013. "The Classy Florals" were two collaboration pieces made during Snic's visit to Evergreen Colorado in the winter of 2013. Right before moving to Colorado, I stopped in to work with Ryno in San Diego California in the late summer of 2013. "The Ducky Princess" was born ready for the beach! 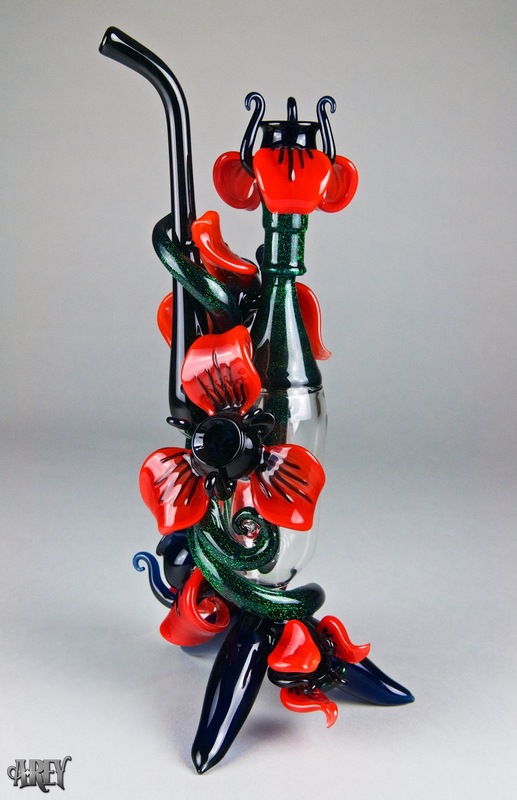 "The Fire Fly" was made during the Pipe Classic in Burlington Vermont 2013. Rising from the Ashes, with wings made of gold. Taking flight as she passes, her strength in the load. Born in the fire, Formed by the light, A brilliant glow emerges, in the darkest of night.